Advanced Cooking Technology combines two heat technologies of convection and microwave with a rotating turntable for fast, even heating. The eikon E3C was designed and made for easy use. It has a touch screen control which is icon-driven. Anyone can use it right away without having to spend a great deal of time in figuring out how to operate the unit. It has a built-in diagnostic testing feature which ensures the safe operation of the unit. The stainless steel construction ensures the durability of the eikon E3C making it easy to clean as well. The interior is also designed for easy cleaning. The eikon E3C is a smart machine. It allows data transfer of more than 1,000 cooking programs through a USB memory stick. The microwave combination mode of the unit can reduce cooking times by as much as six times, which can be a huge boost for any kitchen. The turntable of the eikon E3C is designed to provide an even browning which you cannot achieve when using other microwave ovens. Finally, the unit boasts of a quick pre-heat time. The eikon E3C is ideal for toasted sandwiches, crispy baguettes, and quick snacks. 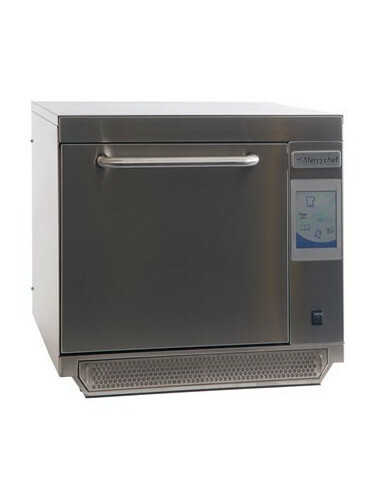 You can rely on the Merrychef to deliver a really solid kitchen equipment. Founded by Christopher E. Tibbs, MerryChef came up with the first commercial microwave oven.The brand became known for its high-speed ovens and other developments like the first convection microwave oven, the first combination microwave oven, the micro thermal accelerated combination microwave oven, the first microwave burger concept, and the first commercial oven with a turntable. MerryChef products are trusted and used in food establishments because of their reliability and brand track record. The merrychef ovens are one of the best kitchen products I have used.